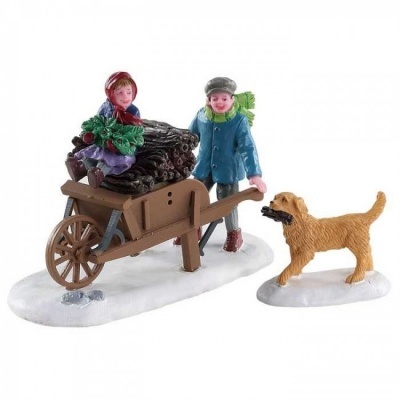 Lemax Gathering Kindling - Set of 2 depicts two happy youngsters using a wheeled cart to collect fallen logs & sticks for the Winter fire, whilst the family dog helps too! A wonderful Lemax figurine miniature set of two which joined the Lemax collection in 2018. Gathering Kindling presents individual hand painted polyresin figures mounted on two snowed bases, to compliment your seasonal Lemax Village winter themed display.